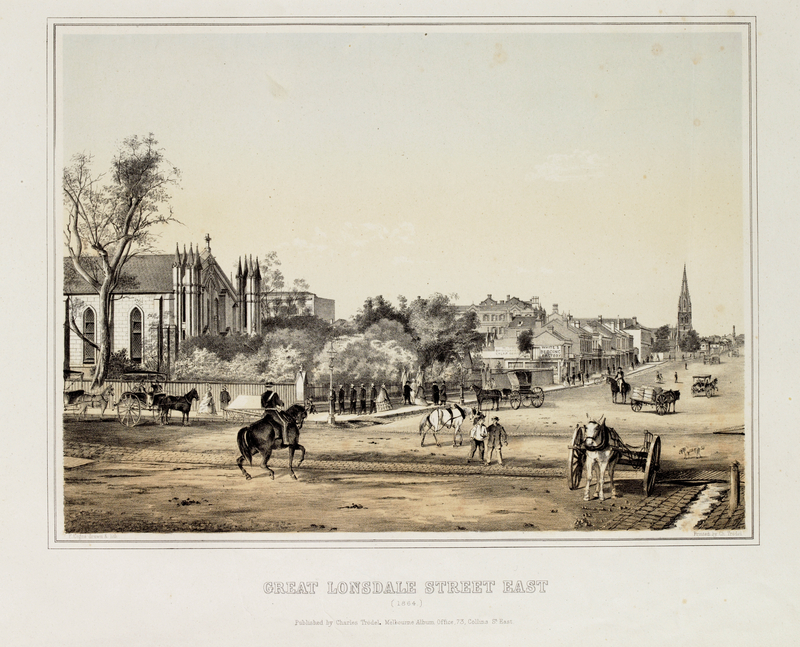 Shows streetscape of Lonsdale Street looking east from Elizabeth Street with St. Francis' Catholic Church in left foreground, Wesley Church further along street, Whites Bedding factory, horsedrawn vehicles, pedestrians and men on horseback. Author/Creator: Francois Cogne 1829-1883. lithographer. Contributor(s): Charles Troedel 1836-1906 Melbourne album. ; Charles Troedel 1836-1906. ; Melbourne Album Office. Description: print : tinted lithograph ; sheet 40.0 x 52.0 cm. Notes: Pl. no. of: The Melbourne Album / by Charles Troedel. Printed under image l.l. : F. Cogne drawn & lith. Printed under image l.r. : Printed by Ch. Trodel Printed under image l.c. : GREAT LONSDALE STREET EAST (1864.) Published by Charles Trodel [sic.]. Melbourne Album Office, 73, Collins St. East. Reproduced in: The Melbourne Album / edited by Clive Turnbull. Melbourne : Georgian House, 1961, p. .